The parent page is on the Road To Amber wiki, at http://wiki.roadtoamber.com/jade. This page is to expand what is written there, rather than to copy it out, so if you have not read it, please do so. Then read about the player-defined setting. Please be aware that some of this information is not available to those without Jade Lore. Some, like the behaviour of the Lords of Penglai towards everybody else, is tolerably obvious. Other things are secret, here for OOC information only. 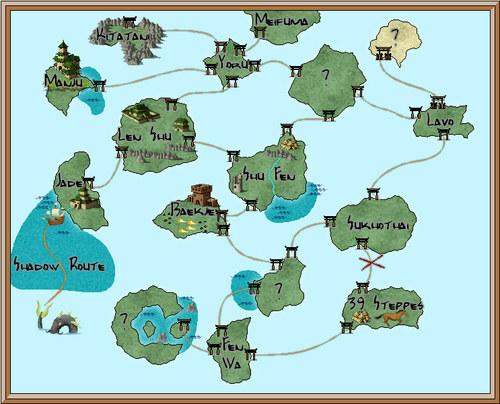 The map to the right is reproduced from the parent page. Penglai is the centre of a network of many many gates. All of these worlds have certain things in common: the Gates that link them, the Bureaucracy that ties them up in red tape, and the Penglai Lords who oversee them. In some cases they still have a certain degree of autonomy, but all of them are subject to Penglai Law. In addition, Penglai is glad to treat Amber with a certain degree of respect. The rest of the Golden Circle is treated as per individual agreement, or by thickly-applied hauteur. Sometimes it is not safe to speak clearly, sometimes, no ordinary words will do for a situation. Speaking in Formal Court Language with Epithets is an art form. It is this which makes Penglai Poetry so famed and so difficult to translate. Shao is the propco for Jade and thus Penglai, and can be contacted by +mail in-game. Jade is '+prop 21'.